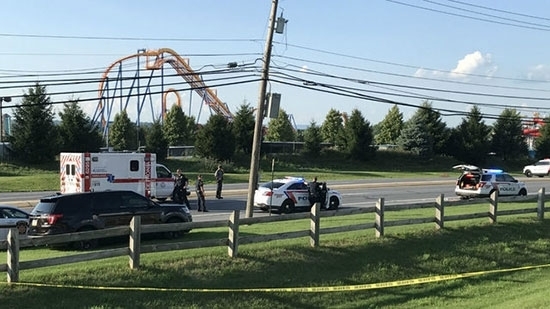 A South Whitehall Township police officer has been charged in the shooting death of a man near Dorney Park in Lehigh County late last month. 33-year-old Officer Joseph Roselli was charged with voluntary manslaughter in the death of 44-year-old Joseph Santos of Hasbrouck Heights, New Jersey. District Attorney Jim Martin announced the charges on Tuesday afternoon, 8/7. The incident happened around 5:45 p.m. on the 3700 block of Hamilton Boulevard at the Comfort Inn and Suites in the shadow of Dorney Park. Santos had been walking in traffic and damaging cars. At one point he jumped on the roof of Roselli's patrol vehicle. Santos got off and began to walk away before turning around and walking back towards Roselli. The officer commanded him several times to stop and get on the ground but Santos kept approached. That's when Officer Roselli opened fire and shot five times. Santos was not armed. DA Martin said that while Roselli may have been in danger, deadly force was not justified. Roselli was also armed with a Taser, baton, and pepper spray. He will be arraigned on Tuesday afternoon. Pennsylvania State Troopers caught a bank robbery suspect on the Schuylkill Expressway (I-76) this morning, 8/7. It happened just after 11 a.m. near the Art Museum. The suspect allegedly robbed a PNC Bank on Conshohocken State Road and Mill Creek Road in Lower Merion. Two left lanes of the highway were closed for the investigation with only one lane of traffic getting by. The body of a woman was found in the Manayunk Canal on Monday night, 8/6. Rescue responded to a report of a person in the water around 10:30 p.m. near Main and Lock streets. Marine units pulled the woman's body from the water around midnight. Police do not believe foul play was involved. A purse and slippers were found on the bank. It appears to have been a suicide.